What is the best method of countering an attacker who intercepted in mid field and is heading straight for the centre of the D? A forward with the ball alone at the 25 can be a pretty intimidating site for a keeper. 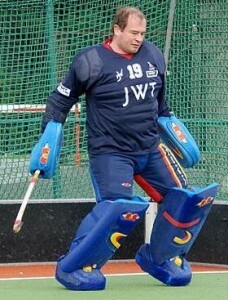 By the same token, a keeper poised and ready at the top of the circle can be equally intimidating. This takes us back to our plan. Before a forward can score, he’s got to get into the circle. 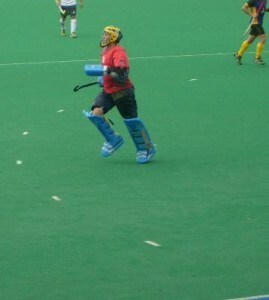 As a keeper, that gives me a boundary that if successfully defended, never allows a shot to happen. As the forward enters the circle, elements that give him the advantage are time, vision, control of the ball and speed. Those elements can also work against him. It’s hard for a forward to have vision and control of the ball. When he’s got vision, typically that’s when the ball is off his stick. When he’s got speed, the ball is either on his stick and his head is down, or the ball’s off his stick. Those are the times when a keeper can win the situation. To add on, a keeper can win a one v one situation without making a save. Winning comes from making a save, delaying the forward until a defender can get back into the play or forcing an opponent to shoot wide. A lot of what will work for you will depend on the strengths of your game. Personally, if faced with an opponent on a breakaway I want to take the initiative and start by contesting entry into the circle. I want to bait the forward to come into the circle where I can use all my goalkeeper privileges (full body to make save) and tackle or channel. If I’m already at the top of the circle a forward can play the ball around me outside of the circle and out run most keepers to walk the ball in. If I’m three to four yards from the top I can step up to engage as the forward enters the circle and use my whole body. I don’t want to come out just for the sake of coming out. Tackling and channeling require good footwork to stay in the play. I don’t want to commit to slide tackling until I’m confident of making the tackle or I can no longer stay in the play. If I have a chance to take a forward to a side, I prefer to take them to my right where I can get more length by playing on my front stick, but having said that if there’s a side that will give my defender a better chance to recover I want to take the opponent there. In taking on a forward, I want him to have to think about me and not a clear shot. If I can slow him down, if I can get his head down, these are all good things. I don’t want to be charging out for the sake of charging out and that’s where engaging distance and balance are key. I don’t want to get wrong-footed. I want to try to keep my shoulder between my feet as I take on. If my shoulders get outside my feet, my weight is committed in that direction and I’m screwed. Similarly, I want my steps to be short and quick so I’m able to keep my weight on both feet to stay with the play. If I take, big long steps I cover ground but a good forward will go at the foot you have your weight on since you can’t move it. I like to play with my hands down around my knees if I’m taking on. This keeps my center of gravity low and makes it easier to get down when I have to. Trial and error are really the best way to figure out the “best way” for you to play situations. The nice thing about the internet is you can learn from other keepers trials. The EHL ( http://www.ehlhockey.tv/#/home/NjQxNA==) uses shootouts in their tie-breakers and are great for seeing different 1vkeeper strategies. Last article of the day! How to tell the difference between a flick and straight strike at the corner. When you are faced with a shot on a short corner, you can gain an advantage by working out the type of shot you are coming up against. Through analysing the shooter’s body patterns and stick positioning, you can work out the type of shot. 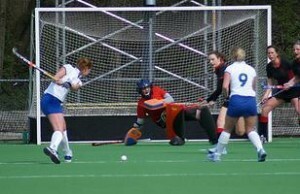 By looking to check which as you set up for the penalty corner, will let you get an advantage; reading the shot and therefore being able to make the correct decision (to stay up or go down) and select the correct save technique (such as a “logging” to block a low shot or diving, standing or high diving to stop a flick). The way to work out if a shot is being taken is by the shooter’s hand positioning. If the shooter on the penalty corner has their hands closed at the top of the stick, this means that they are going to shoot at goal. Mostly shooters will start with the stick touching the ground with the stick upright. However, some strikers (who like to get more power on the shot) will often have the stick in mid-air, so that when the injection comes in, they can drive down to gain more power on the shot. Some hitters like to strike the ball with a ‘baseball swing’; bringing the stick up to shoulder hit and then smashing the stick down to get power and lift on the ball. This is easy to recognise because a lot of players shoot like this. If you notice that the shooter is raising their stick, don’t be put off and get confused: they are making a hard strike at goal. In comparison to a straight strike, if a player is taking a drag flick, then their hands will be open and their lead hand will be further down the stick. The stick will be held with the stick head touching the floor, since no advantage can be gained from lifting it off the pitch. The way the stick is held will determine the angle of the lift; the higher the stick, the higher the flick, the lower the stick, the lower the flick. Although, depending on technique, this isn’t always true. The other key sign is if the shooter is further back than the stopper and the other opposing players at the top of the D. Once the ball is trapped and stopped, they will run in to make the drag flick. Some drag flickers prefer to run into the motion of the flick because it gives them more power and momentum; the speed of the run building up to increase the flick’s speed. Catching up on lost time – think I should get my act together and posting articles I’ve stored up! Anyway, here’s a super quick tip on collecting the ball if you haven’t considered it before, although I guess the chances are slim… we don’t all have ball boys at our games! When the ball goes off the baseline, you will often see the goalkeeper leave their goal to go after it and collect it, to return it to a teammate who will take the free hit. This process means that the defender does not have to go after the ball and gives your team more men and more time to organise for an attack from the back. The goalkeeper goes off to collect a loose ball from the side line. If you do not have a ball boy around to get the ball (especially if you do not play to a high level!) 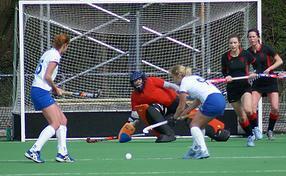 and your defence have been pushing up the pitch, then it is often useful for the goalkeeper to go and get the ball. The reason is simple: by the goalkeeper going instead of a defender, there are more defenders/players on the pitch (with that extra man who would otherwise collect the ball) to get organised into positions where they are free to accept a pass. By collecting the ball and returning it to the team, it means that they are in a better position to organise an attack and push forward. Although it sounds trivial, this speeds up things and makes sure your team don’t lose precious time (remember: the element of surprise only works if you are quick organising!). When the ball goes off the pitch, you should chase after it (good exercise of your agility!) and use your stick to move it (lowering your stick will help you move the ball around with the head of the stick). You can then kick the ball to the open teammate with an accurate pass, so that you don’t have to pick up the ball and move it to the player. Once you have successfully passed the ball and allowed them to set up for the free hit, you should sprint off back into the goal to get ready and prepare in your ready stance, ready for action. Another article on warming up, this time focusing on the Dutch method. If you are going to do it, make sure your shooter knows what they’re doing, as I’ve heard a few horror stories! Before every game, you should complete a warm-up with a shooter to get ready for the upcoming match. It is important to get a good warm up as it will affect your game. If you are alert and ready having done a successful warm-up then you will be able to stop shots in the first few minutes of the match, whereas if you are not prepared, the chances are you won’t do so well. When warming up you should focus on getting your feet moving and watching the ball into the save; copying what will happen during the actual game. It is important that you warm up before you do a proper warm up! Your body needs to be ready for action, otherwise you could end up pulling a muscle before you have even started. Going for a jog before you stretch is a good idea as it will get your blood pumping and warm up your muscles. Before you start taking any shots, it is important that you stretch your body, so that you don’t get injured during the game. Work on stretching your body from top to bottom; you can begin with your neck and shoulders, arms, then move down to your legs, doing the splits as well (if you need), before doing floor stretches for the back etc. Once you have stretched properly, you can pad up. It is also possible to do stretches in your kit to help. 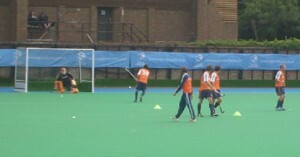 In Holland and Belgium, most goalkeepers warm up without their helmet on, for low shots (I have also seen it done in France, with Julian Thuram of St Germain HC doing it at the EHL). The idea is that you get a better look at the ball, which helps with making eye contact and tracking the shot into the save. By practising this before the match, it will help you make saves with good eye contact; making saves by watching the ball into your equipment. Make sure that the person knows what they are doing, so you don’t get hurt. Before you start facing raised shots, put your helmet back on, unless the shooter is accurate enough with their shots! It is important to start low with the shots to get your foot moving. Your feet are central to making saves; they provide the movement to get into position and are also part of how you balance for a good balance system when stopping shots (you need to have good balance to help control the rebound). Have the shooter take shots at your feet to begin with so you can work on turning away shots with your kickers. Slow paced shots to the sides will also help you with movement; moving across to block the shot in time. Taking shots to the corners will help you stretch your muscles. This is important if you like making splits saves, or play on a weaker team where you have to make a lot of scrambling saves and could end getting injured by pulling a muscles. By having to stretch, you are forcing your muscles to extend and warming them up for these types of saves. Get the shooter to shoot to the sides, wide of your body, so that you have to push far into the save. Now is probably the time to put your helmet back on! Again, it is important to practise facing raised shots because you are likely to see them during the game. Have the team mate shoot shots high enough to get the ball with your gloves; around stomach/shoulder, body height. If you want to stretch and extend to reach the ball, then you can get them to shoot outside the body and around head height, so you have to work for it. Once you have warmed up, you are now ready to get involved in the team warm-up. 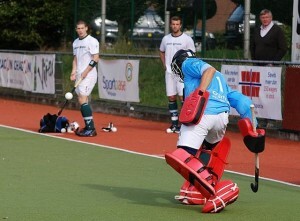 Even though they are not geared towards the goalkeeper, you still need to give 100% effort. 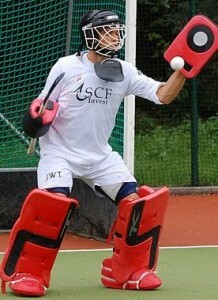 Concentrate on making every save; focus on the ball, have a good stance and make sure you stop the ball. Team warm-ups are also a good time to talk with your team mates and work out routines, like during penalty corners; working out the defence. Another quick article, this time on using a short stick to help enforce making the save with the right hand glove or your glove. Training with a smaller stick is very useful for helping with stick skills and save making. 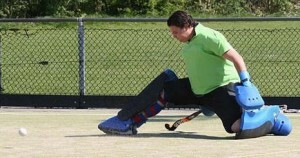 With a short stick, you cannot rely on that extra length of your normal stick to help you make saves or stick tackles and will therefore improve technique. 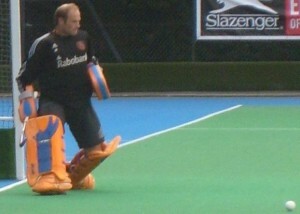 Training with a short stick is good if you over rely on your stick for saves. Without the added length, you will have to be more pro-active in the way you make saves. With less coverage, you will be forced into bringing your glove across to make the save around your stick; with the extra surface area of the glove to help you block shots. It is especially good for practising making saves with the rhp (right hand glove), rather than trying to block with the stick. As shots come in to your stick side, you can push your right hand out to block with the glove instead. Using a stick like this is also useful for training to extend the stick out. With a short stick, you will have to play with it in extension if you want to make a good tackle. Practise letting go of your grip and sliding your hand down the stick to grip the end of the stick, so that you have the full length to use. Once done, you can then slide your hand back up (at some point I will write an article about the technique of extending the stick!). 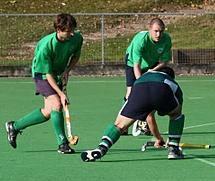 At training, you can practise with your shortened stick; replacing it with your normal stick. Take it to training with you and use it the whole session. 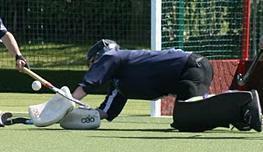 Focus on making the save without the stick and using the stick only to help you balance within your ready stance. Short sticks are fairly easy to get hold of. If you want to play with a short stick permanently, then you should be able to order a goalie stick at a short length, like 30 inches. A cheap alternative is to be a child’s stick and play with that, although I’m not sure if it would stand up to a high level of shots! Just a super quick article on removing your helmet to be more vocal like Ali McGregor does! 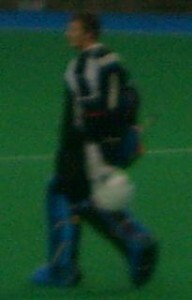 During the game, goalkeepers will often remove their helmet. This is because it gives them a better view of the action and also stops the helmet infringing on their shouting (which helmets often do!). If you ever watch Ali McGregor (GB and Loughborough Students no 1), he will very often remove his helmet when the ball is outside of his zone, so that he can heard clearly by his teammates when shouting out advice to them. The reason goalkeepers like to remove their helmet for two reasons: a better view of the pitch and not being blocked when they shout. Extra vision means they get a better look at what is going on in the game, and they can therefore give better instructions to their defenders as to what to do (open players to mark) and where to go. Masks often block the mouth and therefore limit the sound the goalkeeper can make; muffling their voice when they shout. By removing the helmet, the goalkeeper can shout instructions at their defenders more clearly, so they are properly heard. When you take off your helmet depends on where the ball is on the pitch: if it is just outside the D, then you’re obviously not going to take it off as a scoring chance could happen! When the ball is outside the half, it is safe to take off your mask. The further the ball is in the opposition’s zone (like their 16 or within their D), the longer the time you have to stand around without your mask on. As soon as the ball gets outside of the opposition’s zone and towards yours, it is necessary to put your helmet back on. Make sure you do it instantly; putting it back on as soon as the ball comes loose and crosses your half into your zone, so that you have time to get ready and set in your stance before the opposition have the chance to score on you. You don’t want to leave yourself vulnerable to taking a shot off the head! My obo robo kickers are coming apart, could you please tell me what glue to use? The Velcro attaching the forehead cushion pad to to the inside of my helmet, what glue is best for this? Finally, the wrist protector on my left robo glove has come detached from the inside of the glove, what glue is best to stick the Velcro section back on? Kickers will split with time and use and once they split, glue can only do so much. I’ve had success using Shoe Goo. In addition, zip ties will reinforce any glue bond, especially in kickers where there is alot of stress to the bond. I’ve had a lot of success using something called Gorilla Glue to fasten velcro to foam. Make sure to follow the directions on the Glue for best results. Surfaces to be glued need to be clean and dry and Gorilla Glue requires pressure so you’ll need a clamp. As a note, don’t overdo it with Gorilla Glue as the glue expands with the bonding process. A little goes a long way. Is the keeper allowed to kick the ball off an opposing player’s stick (kicker-stick contact)? Is the keeper allowed to hit the ball off another player’s stick with his/her goalie stick? Any contact by a keeper, whether kicker or stick must be to the ball first. If after contacting the ball, the keeper’s kicker or stick contacts the opposing player’s stick then the play should be legal. However, if the umpire deems that the keeper contacted the opponent’s stick first and then got ball the penalty is either a corner or possibly a stroke. Unfortunately, umpires often make this call based on sound (especially with stick tackles) as they are usually positioned on the endline behind the keeper in an attempt to stay ahead of the play. This can leave the umpire with an obstructed view of the play. If you’ve made a tackle where you feel you’ve got ball first and the call has gone against you, the best you can do is ask the umpire to ask for help from their partner. Can I paint my CK helmet? admin on Own-goal rule: opinions wanted!